papad recipes. 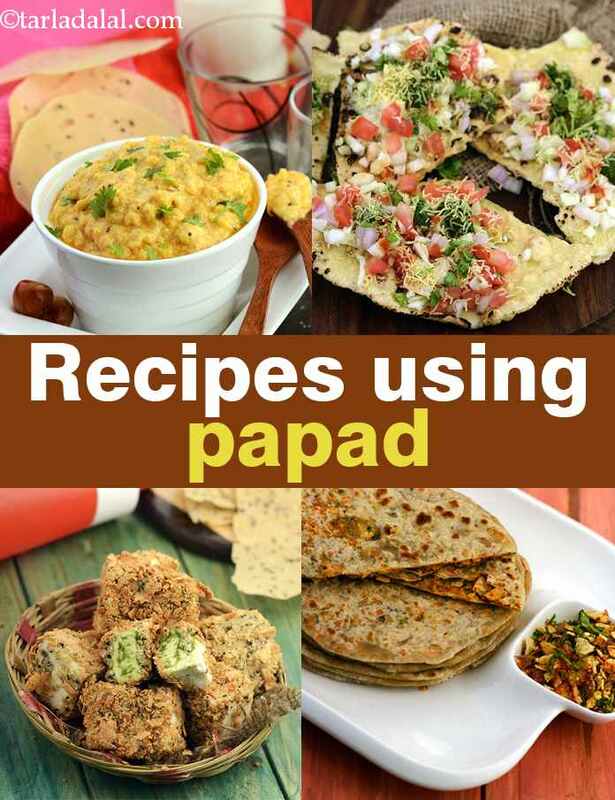 recipes using papad. Papad or Papadum is a thin Indian wafer, sometimes described as a cracker or flatbread. It is usually made from a dough of lentils flour. The dough is shaped into a thin, round flatbread and then dried (traditionally in the sun) and can be cooked by frying, roasting over an open flame, toasting, or microwaving, depending on the desired texture. You can perk up the dough with the addition of seasonings like chili, cumin, garlic, or black pepper. There was a time when Indian households had a charpoy full of papads drying in the sun. But, people now prefer buying readymade dry papad from the market. South Indian papads popularly referred to as appalam are made using urad dal or rice flour. While those made with urad dal flour & moong dal flour called as Bikaneri papad are popular in Rajasthan and then there are Punjabi urad dal papads. In fact, there are papads made with ingredients like potato, sago that can be consumed during fasting days. Papads can perk up the simplest of meals with its crunch and tongue-tickling flavours. No wonder it is a popular accompaniment to an Indian meal. Papads come in different shapes and can be transformed to create delightful snacks and munchies. The first thing that my family orders every time we are dining in a restaurant is masala papad. It is an amazing appetizer that will keep you stuffed while your order arrives. You can opt for a fried or a roasted one depending on your preference. The papad is sprinkled with chopped vegetables and spices & served with peppy green chutney. Khichiya Papad is another popular varieties of papad in India, made of spicy rice flour dough. Here is a recipe to make Khichiya Papad at home. In fact, the Masala Khichiya Papad is a popular roadside snack in Mumbai. The characteristic smoky flavour and crunchy texture with a dash of freshly chopped vegetables, chutney and sev is a delight for the palate. You can make it at home and savour with humble meals like dal-rice or khichdi. We even have a recipe for Instant Whole Wheat Masala Papad which can be made quickly and requires no drying. This masaledaar papad is sure to surprise your whole family! Papad is a popular ingredient in Rajasthan. It is not only used to make interesting side dishes like papad ki churi but also, used to make curries like Papad Mangodi ki Subzi and Methi Papad. Relish them with jeera rice or roti. Papad is a great substitute to breadcrumbs. You can make lovely appetizers like Papad Potato Roll, Papad Paneer Ke Kurkure or Paneer Fritters. These awesome snacks are crispy on the outside and soft on the inside. They simply melt-in-the-mouth and are perfect finger foods for cocktail parties. Stuffed parathas using mooli, aloo, gobhi is quite common. How about trying something innovative? These Papad Stuffed Parathas are spicy and delicious. Papad poha, a crispy snack made by combining roasted poha and crushed roasted poha is a popular Jain jar snack. There are endless ways to use papads. We hope you enjoyed our collection of 70 papad Indian recipes. Do share with us your innovative recipes in the comment section below. Chilli-garlic paneer potato balls, dipped in batter, coated with coarsely ground Papad, and deep-fried till crisp. Just a description of this dish is enough to make your kids drool over it. Ideal protein-rich snack to serve when your kids take a break while studying for the exams! Flaked rice and papad sautéed with spices and peanuts. Using thinner variety of poha known as patla poha or nylon poha, helps to make crispier snack.